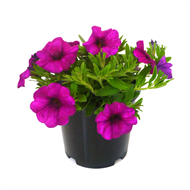 SuperCal Petchoa is the first in a series of exciting new flowering perennials which combines the best characteristics of the Petunia and Calibrachoa. Bred to deliver maximum outdoor performance with high impact colours, the SuperCal Petchoa series has strong vigor, exceptional flower power and lush foliage. Disease resistant with no sticky foliage and outstanding performance in most weather conditions makes SuperCal Petchoas ideal for hanging baskets, window boxes, containers and mass planting. Stays beautiful hot or cold, rain or shine!